The Book of the Cave of Treasures is a sixth century Christian sacred history written by a Jacobite. The text is attributed to Ephrem Syrus, who was born at Nisibis soon after AD 306 and died in 373, but it is now generally believed that its current form is 6th century or newer. 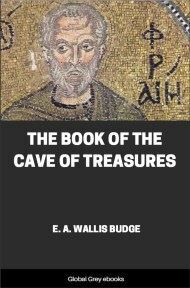 The assertion that the Cave of Treasures was written in the 4th century is supported by the general contents of the work. This book and The Book of the Bee are both interesting because they present the 'history' of the world from the creation to the death of Christ, thus reproducing a good bit of the story contained in the Bible, but they also contain many stories not included in the canonical account, some of the material being Jewish, some of it Greek, and some of it Mesopotamian. IN the centuries immediately preceding the Christian Era certain professional Jewish scribes composed a number of works which may well be described as "historical romances," and which were based on the histories of the patriarchs and others as found in the four main divisions of the text of the Hebrew Bible. There is little doubt that most of these works were written either in Hebrew or in the Palestinian vernacular of the period. One of the oldest of such works appears to be the "Book of Jubilees" (see page 3), (also called the "Lesser Genesis" and the "Apocalypse of Moses"), which derives its name from the fact that the periods of time described in it are Jubilees, i.e. each period contains forty-nine years. It is more or less a Commentary on the Book of Genesis. 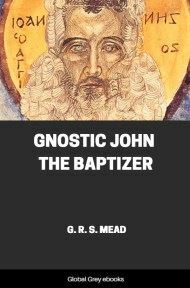 That a version of this book existed in Greek is proved by the quotations given by Epiphanius, Bishop of Salamis in Cyprus (born about A.D. 320, and died in 403 or 404), in his work on "Heresies" (chapter xxxix). 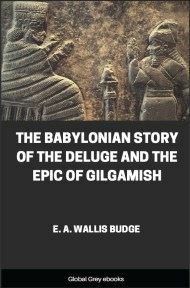 The author claimed boldly that his work contains the revelations which were made to Moses by the command of God by the Archangel Michael, who is frequently described as the "Angel of the Face," The book is not wholly original, for it contains narratives and traditions derived from the works of earlier writers; and some of the legends appear to have been taken from early Babylonian sources. The Hebrew, or Aramean, original is lost, and the complete work is only found in Ethiopic, in which language it is known as "Kûfâlê," or "Sections." The Ethiopic translation was made from Greek. From time to time during the early centuries of the Christian Era apocryphal works dealing with our Lord and His Apostles and disciples appeared, and, though they were written by Christians, they contained many legends and traditions which their authors borrowed from the works of earlier Jewish and Christian writers. Such works were very popular among the Christian communities of Egypt and Syria, for the thirst for information about our Lord and His life and works, and the adventures and successes of the Apostles in Africa, Western Asia, India and other countries was very great. 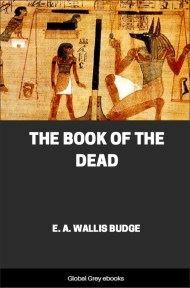 Side by side with this apocryphal literature there appeared works in Egypt and Syria which dealt with Old Testament History and endeavoured to explain its difficulties. But though Patriarch and Bishop and Priest read the Scriptures and the commentaries on them to the people, and instructed their congregations orally on every possible occasion, there was much in the ancient Jewish Religion, out of which many of the aspects of the Christian Religion had developed, which the laity did not understand. On the one hand, the unlettered Christian folk heard the Jews denouncing Christ and His followers, and on the other, their teachers taught them that Christ was a descendant of King David and Abraham, and that the great and essential truths and mysteries of the Christian Religion were foreshadowed by events which had taken place in the lives of the Jewish patriarchs. Some of the Fathers of the Church in the Vth and VIth centuries wrote sermons and dissertations on the Birth of our Lord, and His Baptism, Temptation, Passion and Death and Resurrection, and proved by quotations from the Prophets that the son of the Virgin Mary was indeed the Messiah and the Saviour of the world. But copies of these works were not multiplied for the use of their congregations, most of the members of which were unlettered folk, and the influence of all written discourses was much circumscribed in consequence. The great monastic institutions possessed copies of the Old and New Testaments written in Greek and Syriac, but these were not available for study by the laity in general, and it is probable that only well-to-do people could afford to have copies of the Books of the Bible made for their private use. Thus the circumstances of the time made it necessary that the Fathers of the Church, or some of the learned scribes, should compile comprehensive works on the history of God's dealings with man as described in the Old Testament, and show the true relationship of the Christian Religion to the Religion of the Hebrew Patriarchs and to kings of Israel and Judah. 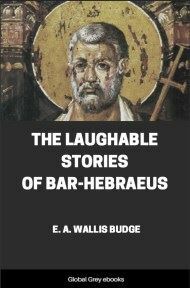 There is little doubt that many such works were written, and that their authors based their histories on the writings of their predecessors, and that Christian writers borrowed largely from the Hebrew "Book of Enoch" and the "Book of Jubilees," as well as the Histories and Chronicles which were then extant in Greek. Some of the latter works, i.e. those in Greek, were written by men who had access to information which was derived from Babylonian and Assyrian histories written in cuneiform, and, thanks to the labours of Assyriologists, the statements based on such information can, in many cases, be checked and verified. Further reference to this point will be made later on.